You can order a Domino's Pizza in 81 different countries and 8,200+ stores worldwide. But one local Domino's store couldn't sell any pizzas for almost three days last week after inspectors found evidence of rodents in the kitchen. 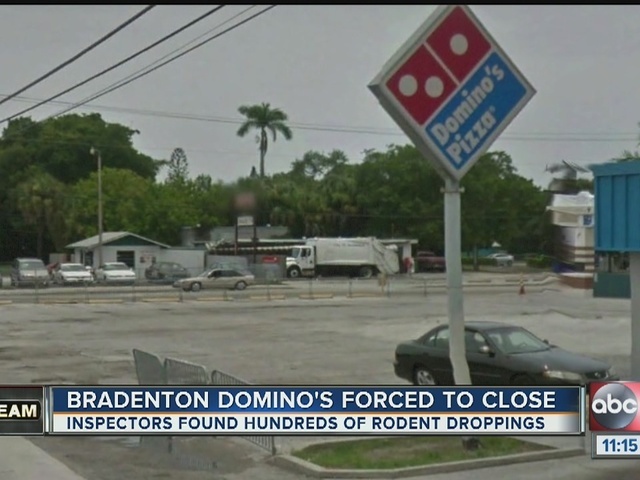 Domino's Pizza in Bradenton at 812 17th Avenue West had to temporarily shut down on December 28 through December 30 after the state discovered 470+ rodent droppings throughout the establishment. Last Wednesday, the state found over 200 rodent droppings on shelves and under the prep table at the cook's line, under the Coca Cola cooler, near the dry storage rack, on containers of food, behind the pizza oven, under the hand washing sink, near the walk in cooler, and storage closet. Inspectors also uncovered rodent nesting materials near the walk-in cooler and foam from the wall being chewed into small pieces by the rodents. And when inspectors returned on Thursday, December 29 for a follow-up inspection, rodent activity was still present with 273 new rodent droppings seen. Critical temperature issues also plagued the Bradenton Domino's location with sliced sausage at 50°F, chicken at 44°F, feta cheese at 44°F and mozzarella at 46°F. All cold food should be held at 41 degrees Fahrenheit or below. The food manager's certification had expired, employees had no proof of required state approved training, no hand wash sink was in the food preparation area, mold-like substance was at the walk-in cooler, food stored in bins had rodent droppings on the lids, a hole was seen in the ceiling and water was draining onto floor under the three compartment sink. ABC Action News anchor Wendy Ryan called the Domino's and spoke to Rich, the manager on duty, but he hung up on her when she asked about the rodent problem. Ryan also reached out to David Whitney, the public relations person at Domino's Ad agency of C, P, and B Global Network but he never e-mailed her back.